There were 762 press releases posted in the last 24 hours and 153,558 in the last 365 days. Have an idea but not sure how to make it work? Seda's graphics department turns ideas into reality. LOS ANGELES, CA, US, April 10, 2019 /EINPresswire.com/ -- No matter what the job is, Seda’s Printing in LA can handle it. 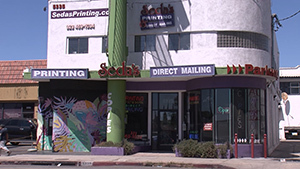 Seda’s is always the printing services near me for the greater Los Angeles area. If it can be printed, they can do it. From business cards to posters and everything in. Between Seda Kangani and her crew specialize in bring a customer’s idea to reality. Seda’s Printing entered the print world when offset printing was the mainstay. Technology has advanced and Seda’s has kept pace. The shop now offers traditional printing services as well as the most modern digital printing. The shop still offers everything from design to the finished product. Design includes a proof to the customer to make sure everything is right before committing to the entire print job. Because of the electronic nature of print jobs these days, Seda’s Printing always offers printing services near me. Ms. Kangani said a customer can be anywhere in the world and request a print job from the the shop these days. For more information visit www.sedasprinting.com.